Process level data chart could also be used together with the control charts to find which particular process is responsible for some unusual spikes. The figure above shows how the CPU usage by processes chart can be used to explain that incremental daily back-up causes small daily spikes on the control chart of Network traffic (NIC level). 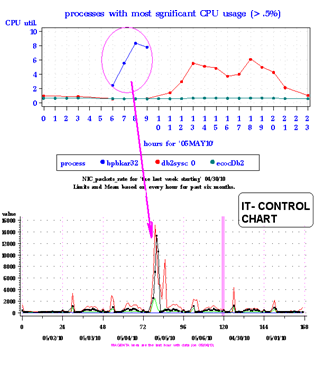 The full back-up caused one big spike per week expanding activity to work hours, which could be dangerous to interfere with other DB2 on-line workload on that server.